Kings Island has hired a new Director of Communications, Chad Showalter. I have been in contact with Chad to get to know more about him and introduce him to KIC. Below is what Chad had to say about his new role at Kings Island. Don Helbig is still at Kings Island with the position of Area Manager, Digital Marketing. Don states, "My position has evolved into two distinctive different jobs between PR and social media. The majority of my time had become on the digital side since 2014, so it has made for a very easy transition for me." I grew up in the Cincinnati area, and as a boy my family would visit Kings Island about once a year. My parents weren’t roller coaster riders, so my first major roller coaster was the Magnum XL 200 at Cedar Point when I was 11 years old, which I rode on a trip with friends. From that point on my theme park visits focused on thrill rides. In high school I worked at Rivertown Pizza for multiple seasons doing everything from working the line to grating cheese. During college I was the supervisor of the seasonal Human Resources team and managed the Group Volunteer Program. I have had a Kings Island season pass for nearly 20 years. These days I spend a lot of my time in Planet Snoopy with my family, but still find time to take in the coasters and other attractions. 2. How long have you been in Public Relations? I’ve worked in public relations, communications and marketing for nearly 20 years, from agencies to small and medium-sized businesses. Most recently I served as the Senior Marketing and Communications manager for Newport Aquarium, just across the river from downtown Cincinnati. 3. What drew you to apply for the director of communications position at Kings Island? 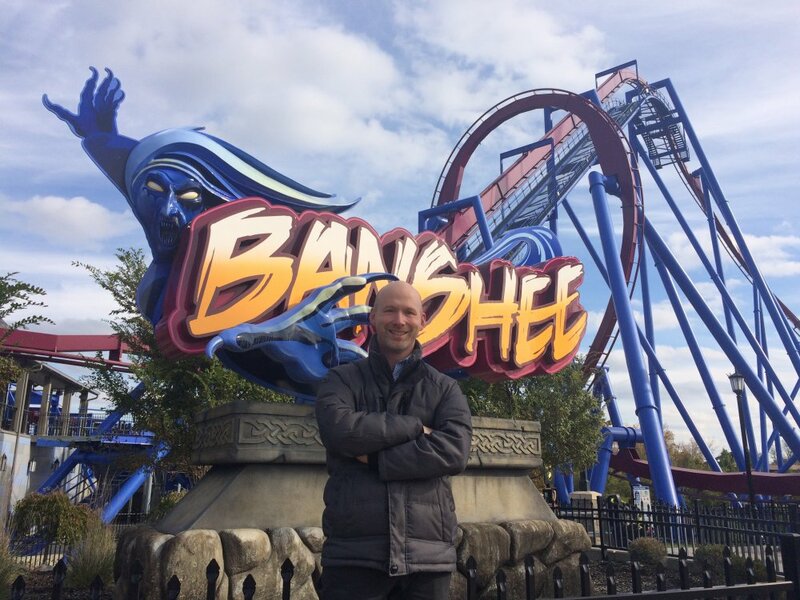 The Kings Island marketing team has a reputation for being one of the best in the industry, and the chance to possibly join that team was a once-in-a-career opportunity I couldn’t pass up. 4. What are you most excited about in your new position at Kings Island? I’m most excited to help tell the stories of the people who experience this incredible park and what’s happening here. 5. How does it feel to go to work at Kings Island with coasters and rides outside your office? It’s incredible. Knowing that less than a hundred feet away from my office there are kids, families and thrill seekers entering the park for the first time, and others walking down International Street who have been coming to Kings Island for years, reminds me of how important our job is- to help them create memories together and make Kings Island a place they want to return for years to come. 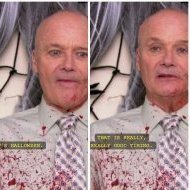 My office looks out at one of the employee behind-the-scenes paths, and on Fridays during Halloween Haunt I’ve enjoyed watching a parade of hundreds of scare-actors passing by my window on their way to work. 6. Are there certain types of rides you don't like? No. I always ride trying to understand the intention of the ride. Is it for Thrills? Family moments? Nostalgia? There are some rides I love because my kids like them and I love watching their reactions and sharing that experience with them. Other rides I love because I grew up riding them, and, of course, some because of the speed and thrills. If there’s one ride I don’t care to ride at Kings Island, it would be Boo Blasters- but only because my wife gets a higher score than me every single time. 7. What is your favorite ride at Kings Island? The Beast, but Mystic Timbers is a close second. Like so many others in this area, Flight of Fear was my first LIM launched coaster, so it’s also near the top of my list. 8. Before taking this position, did you visit or have an account on KICentral? KICentral welcomes Chad to Kings Island and we look forward to working with you in the future! Welcome Chad! Looking forward to seeing your work! Welcome, and working at a historic park with legendary fans and devoted fans. Welcome indeed! Thanks for providing us with the interview, @IndyGuy4KI! Welcome and congratulations for getting the dream job many of us would love to have! It makes me really happy that in addition to being imminently qualified for the job, he is enthusiastic about Kings Island in particular on top of that! Looking forward to seeing his work in the future! Welcome and congrats on the job! Welcome Chad! You seem to have a love and interest in the park, which is great for your position! I am excited he knew about and visited KIC when he was just a guest like us. Just too cool! I love hearing stories like this about people achieving their dreams. It gives me hope for the future. Congrats Chad! Winterfest in US News & World Report Winterfest article, featuring Mr Showalter.